For more information about templating and how to modify the default templates read the common topic on Implicit Styles. Using Implicit Styles gives you the ability to easily extract and edit the default ControlTemplates of the controls. 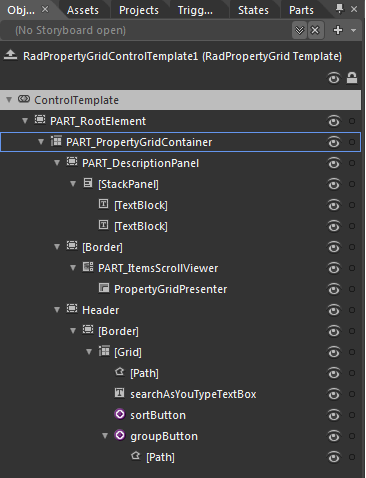 You can follow this article on two different approaches on how to extract the ControlTemplates. SearchAsYouTypeTextBox- represents the RadPropertyGrid’s SearchBox and is of type TextBox. [Border] - represents the inner border and the background of the row, when the mouse is over it and is of type Border. Manually extract the template template from the Themes.Implicit files we ship with every installation. 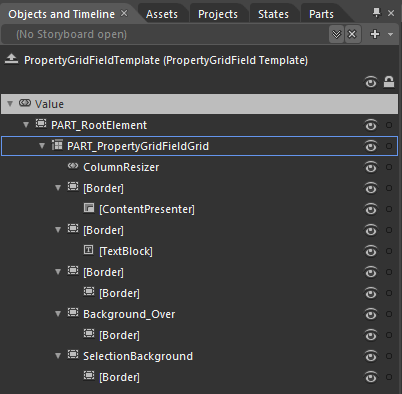 You can find it together with all the other templates used for the PropertyGrid inside "Telerik.Windows.Controls.Data.xaml" file browsing to "C:\Program Files (x86)\Telerik\UI for [product][version]\Themes.Implicit\OfficeBlack\Themes" folder. Please note there is a different folder for each Theme and you should browse to the one you use.